If you find yourself experiencing blurred or distorted vision that seems to get worse as the years go by, you may suffer from an irregularity of the cornea called keratoconus. This condition is known for causing nearsightedness and astigmatism that can progress rapidly, which means that your corrective lens prescription needs to be updated frequently. Fortunately, there are several treatment options available to help you cope with the challenges of keratoconus. Although the cause of keratoconus is not clear, the condition occurs more frequently in people who have worn contacts habitually for many years, rub their eyes a lot, or have certain genetic disorders such as Down syndrome. Keratoconus can also develop in pregnant women, which could be an indication that endocrine system imbalances are involved. The condition occurs when the tissue of the cornea grows unusually weak or thin. As a result, it loses its perfectly spherical shape and takes on more a cone-like outward bulge. If the cornea is deformed in this manner, it cannot refract incoming light to create an accurate image for the retina. Keratoconus usually appears between late childhood and the mid-20s, after which point it may grow progressively worse for many years. The progression is often dramatic, with sufferers having to get new prescriptions for lenses practically every time they see their eye care provider. Blurred vision is the obvious primary symptom, but eyesight can also become cloudy or hazy if a rupture at the rear of the cornea occurs. Patients may also find their eyes growing increasingly sensitive to bright light. 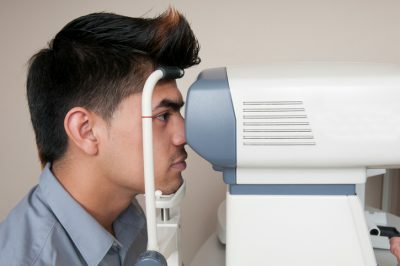 If keratoconus is mild to moderate, vision problems can usually be corrected through conventional methods such as eyeglasses and soft contacts. More stubborn cases may require gas-permeable rigid contacts, scleral lenses, or custom-made silicon hydrogel soft contacts. It is even possible to “piggyback” a gas-permeable lens on top of a hydrogel lens to achieve the optimal balance between vision accuracy and comfort. Traditional laser surgeries such as LASIK are not usually recommended for patients with keratoconus, but it is possible that other types of structural correction could provide the desired vision correction. For example, intacs, tiny corneal inserts implanted just below the corneal surface to flatten out the cone-like curve, can be inserted in a minimally invasive surgery. For the most extreme cases, a corneal transplant is an option. However mild or severe your keratoconus, your eye care professional can explain your treatment options and help you to devise an effective treatment plan.